When it comes to replacing a missing tooth, you have several options, including a removable partial denture or a fixed bridge. But the premier choice is “the new kid on the block” at just over thirty years old: dental implants. Implants are by far the most popular tooth replacement choice among both patients and dentists. But they also happen to be the most expensive option, at least initially. So the question is, why invest in dental implants over less costly choices? Here are 3 reasons why implants could be well worth their price. More Like a real tooth than other restorations. Implants can match the life-like appearance of any other replacement choice, often utilizing the same types of materials. But where they really excel is in function—how they perform while biting and chewing. This is because the dental implant’s titanium post imbedded in the jawbone replaces the tooth root. No other dental restoration can do that—or perform better when comparing the resulting functionality. Best long-term solution. As we mentioned before, the initial implant cost is typically higher than either dentures or bridges. But you should also consider their durability compared to other choices. It could be potentially much longer—possibly decades. This is because the titanium post creates an ultra-strong hold in the jawbone as bone cells naturally grow and adhere to this particular metal. The resulting hold can withstand the daily forces generated during eating and chewing. With proper care they might even last a lifetime, and actually cost you less in the long run over other choices. Adaptable to other types of restoration. 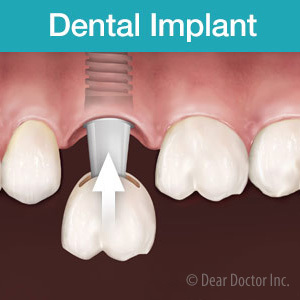 Implants have greater uses other than as individual tooth replacements. A few strategically placed implants can also be used to support removable dentures or a fixed bridge for multiple teeth or an entire dental arch. As the technology continues to advance, implants are helping to make other restoration options stronger, more stable and longer lasting—and adding more value to your investment.